Celebrating the Victory we have in the Lord Jesus Christ with great gospel music that will lighten your heart and lift your spirits. Bring a friend or several friends for an evening that you are sure to enjoy. Friday, June 7 - 7 p.m. 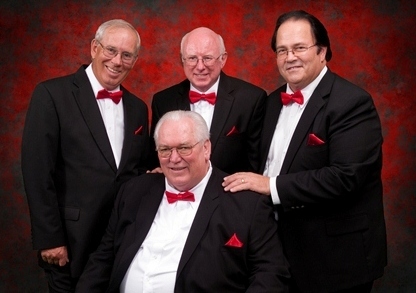 The June 7 Victory Gospel Jubilee will feature one of Ohio’s longest tenured Southern Gospel quartets — The Fishermen from Clyde, Ohio. This concert will kick off the 2013 season for the Victory Gospel Jubilee hosted by the Golden Street Singers of Farmdale, Ohio. Again the Jubilee will be staged at the auditorium of the North Lima Business Complex, the former South Range High School at 11836 South Ave., North Lima, OH. Singing begins at 7 p.m.
2013 marks the 40th anniversary of the formation of The Fishermen Quartet. 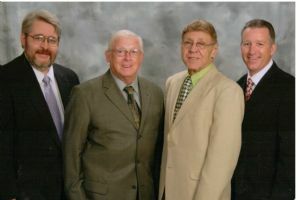 The Fishermen Quartet was organized in 1973 in Clyde, Ohio by two brothers — Larry and Jim Kessler — and good friend Max Wright. Later a bass singer was added. At one time they had a full band — piano, bass guitar, drums, and lead guitar. In the 1990s the group disbanded and Larry and Max sang in some other groups. Eventually, however, they started The Fishermen back up again. They have several CD’s and sing the great songs of Southern Gospel music. They spread the word of Jesus with wonderful harmony. Come joint us for an evening of good gospel music. No obiligation. No cost to you or your church or group. Just provide a good location and we will do the rest! The Majestic Sounds Quartet from Wilmington, OH showed the crowd tey could really sing quartet music at the Victory Gospel Jubilee onÂ October 5. The Golden Street Singers from Farmdale, OH and Mary St. Clair from Fredricktown, OH completed the lineup for the second session of the Jubilee. It was "Pastor Appreciation Night" and several pastors and former pastors were presented with $25 gift cards to Chic-fil-A by the Golden Street Singers. Those in attendance at the first Victory Gospel Jubilee on Friday, Sept. 7, 2012 enjoyed more than two hours of gospel music from Country Gospel Association of Branson award winner Bill Sanders from Ypsilanti, Michigan and Sole Purpose Ministries artist Linda Weber of Coshocton, OH..Â The evening was hosted by the Golden Street Singers from Farmdale, OH. Attendees raved about the venue, a former high school auditorium with a full stage with not a bad seat in the house. And they also appreciated the professional quality and variety of the music performed and the ministry presented by the singers. Most all of those in attendance picked up tickets for the Oct. 5 Jubilee and vowed to bring someone new with them. Copyright 2012 Victory Gospel Jubilee. All rights reserved.